Chichen Itza is known as one of the New Seven Wonders of the World, and when you look upon it for yourself, it’s easy to see why. 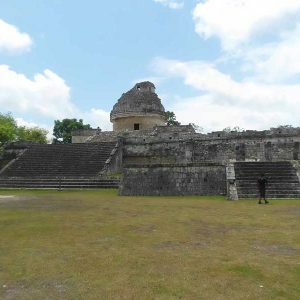 One of the best preserved Mayan ruins in existence, and home to the spectacular pyramid of Kukulkan, this Chichen Itza deluxe tour from Tulum makes for a truly unforgettable experience. 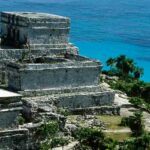 You’ll feel like you’ve been transported back in time hundreds of years, and get to learn all about the Mayan traditions and culture that made up their vast empire. 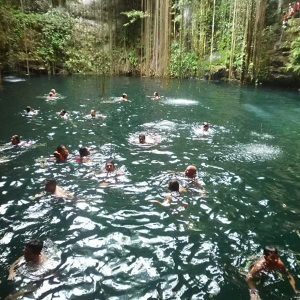 That’s not all, though- you’ll also have the chance to relax and swim in a stunning natural cenote. The day starts with you being picked up. As we travel between the sites on the Chichen Itza tour from Tulum, you’ll be able to sit back and relax in our deluxe tour bus. Complete with large, comfortable seats, tables and TVs, and an onboard bar serving up a range of alcoholic and soft drinks. You’ll even be treated to a delicious continental breakfast! 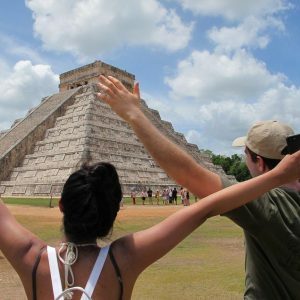 Once you arrive at the site, you’ll be taken on a guided Chichen Itza tour, where you’ll learn all about how the people here once lived, and why this place was so special to them. The former city was once a sprawling metropolis, and was likely the capital of not one, but two different empires. Many of the buildings have survived to the present day. 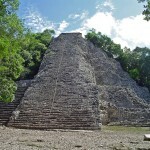 The most prominent of these is the Kukulkan Pyramid one of the Seven New Wonders of the World. You can go right up to the pyramid and look at the intricate carvings, and it’s clear how such a vast building would have been highly important to the ancient Mayans. As an architectural representation of the Maya calendar, it would have formed a key part of life here. 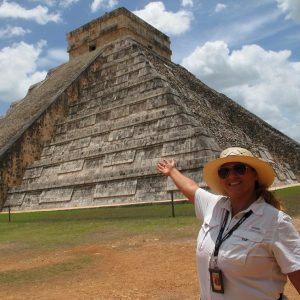 Once the tour is done, you’ll then have some free time to take your own Chichen Itza tour, and wind your way through the buildings. You’ll stumble upon ancient carvings and tombs, and there will be plenty of photo opportunities! You’ll also find the Juego de Pelota, or Ball Court- a sign that Mexicans have always been keen sports fans, even hundreds of years ago! When you’re all done with your Chichen Itza tour, the day isn’t over yet. 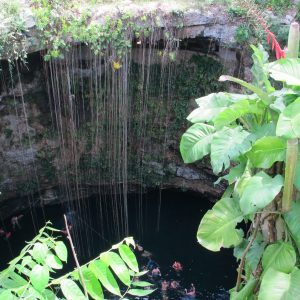 We’ll stop by one of Mexico’s most famous cenotes, Cenote Ik Kil. These underwater caverns have formed over millions of years, and are home to a unique blend of stalactites, stalagmites, and marine fossils. Here, you’ll be able to get some respite from the tropical heat, and take a dip in the cool, clear water. A tasty lunch will also be provided at this point. Ik Kil is a popular destination for tourists, and for good reason- it’s one of the most beautiful cenotes in the country, and it lets you get up close and personal with some of the local wildlife. 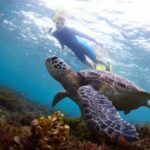 From tropical fish to birds nesting on the rocks, this stop on our tour lets you see the natural side of Mexico, the world that the Mayans would have lived in. Located some 26 meters below the ground, vines and small waterfalls flow down into the pool, and there’s even a small Mayan ruin nearby. When the day is done, you’ll be taken back to Tulum once again in our luxury bus. 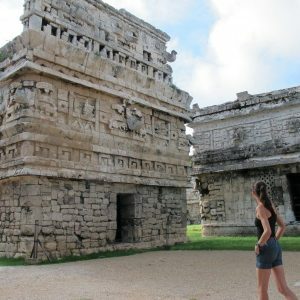 Our Chichen Itza tour from Tulum is packed with excitement, and is therefore the perfect way to explore this ancient part of the world. Make sure you book your place on our next tour, so you can experience it for yourself! Swimwear, Biodegradable Sunscreen, Money for tips, Comfortable Footwear, Camera, Water, Snacks, Towel, Hat. 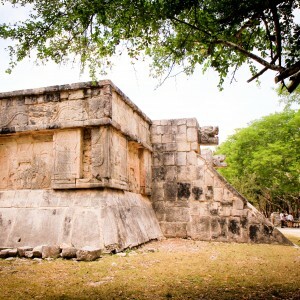 *You will receive your Chichen Itza deluxe bus tour from Tulum confirmation within 24 hours of purchase. Next day tours must be reserved by 7 pm, and confirmation will be expedited if available. For next day orders after 7 pm, or any other questions please email us at info@wonderousworld.com and one of our team will be happy to assist! This was one of our favourite days while in Mexico. The tour was extremely well organised yet we never felt rushed. Our tour guide Norma was exceptional. We learnt so much from her vast range of knowledge. Lunch was delicious, the cenote was stunning and Chichen Itza was simply breathtaking. The bus itself was comfy and my hubby loved the bonus Caronas! Would highly recommend this tour to anyone! Thank you!! 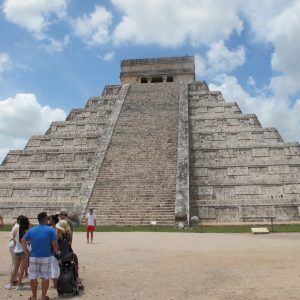 Awesome Chichen Itza tour, we had a great time! Especially like the onboard drinks that are included, maybe a little too much haha Chichen Itza was amazing as expected but a bit crowded at times. We found a back area that the tour guides dont go to where you can stretch out on the grass next to mayan structures and chill out if you want with very few people. The cenote also pretty awesome but a bit crowded, I guess with good reason. I would have liked a little more time there. 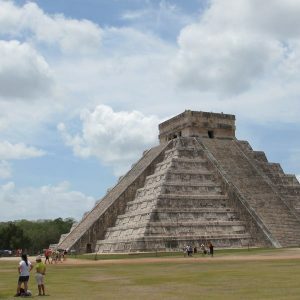 This is my only Chichen Itza tour before but would have to say it was a good one.